The definition of what “Tonic” is has expanded* significantly in the last couple of years. I would place this expansion squarely within the trend of “making it yourself” and the healthy skepticism about about “what IS in our food?” What exactly IS in Tonic Water? Often times High Fructose Corn Syrup and very little that resembles the tonic water of old. The craft revolution has come from the farmer’s market and now sits squarely in the bar. So cocktail celebrities like Jeffrey Morgenthaler have written excellent guides to making your own tonic water from scratch. 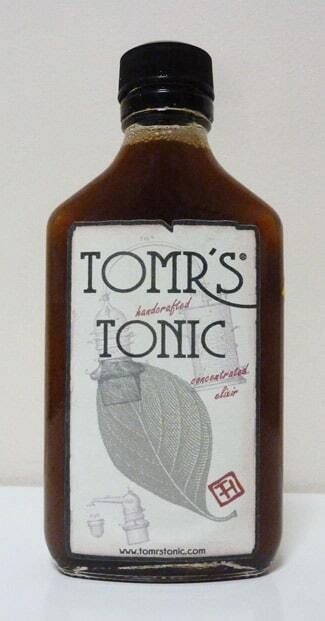 And companies like Tomr’s have brought the hard work of homemade tonic to the home cocktail crowd and the now rare bar without a housemade bitters program. Strong notes of cinnamon and a warm fruity taste. There is a pronounced bitterness but its sweeter and decidedly less herbal than you might think. It begins very fruity and well rounded. Warm hints of citrus and remarkably pleasant. At first I was struck by how radically different this Gin and Tonic was from what you may be used to. Strong notes of cinnamon and orange come through. The requisite bitterness and flavor from the quinine is muted put still refreshing and palate cleansing, beckoning a second sip. I tried to mix it with lime and it was very difficult to add enough lime to taste it, but not so much as to overwhelm the drink. Tomr’s has enough citrus to go around, so I’d even say that you can feel safe leaving out the lime altogether and you’ll still have that nice harmony between citrus, bitterness and the heat of the gin. So How do I use Tomr’s?! And I have a hard time recommending a way to improve this ratio. This makes a delightful well-rounded gin and tonic, if one that looks more like a root beer than what you may be used to. But where I’m really interested in Tomr’s in its ability to create new cocktails. For example, you could create a martini and tonic. Try a standard dry martini ratio of 7:1** but add another 1 part of Tonic Syrup. You’ll get a lot of the flavors of gin and tonic, but with the slow savorability of a martini. I think there’s a lot of ways that you can put Tomr’s to work and add a bitter note (a la bitters) without diluting with soda water. * Or “re-expanded” may be a more appropriate way of phrasing it. These tonic syrups have more in common with the tonic water of a century ago rather than the tonic water we think of today. ** Which those of you who are frequent readers of The Gin is In know that I’m a bit adamant that a “Churchhill Martini” is not a martini, it’s a delicious ice cold gin. 7:1 is rather extreme if I weren’t altering the recipe with a little something else.